Oil painting is not the easiest of mediums to learn. There are rules. There are regulations. Get it wrong and you can end up with cracks and flaws that can spell disaster to even the most well thought out painting. I’ve ended up with cracks on two paintings over the last few years…and its frustrating to say the least. The hardest thing about painting for me though…is CHOOSING what to paint! Since making the decision to focus on figurative, narrative work, the image choice has become even harder. I look for strong composition, light, emotion and story telling. It’s not easy to find this in all photos, which is why I have spent as much time over the last two years improving my understanding of photography, along with the skills needed to oil paint. I can now plan a painting from the ground up…taking a thought, an idea, that I can then develop into a photo shoot and then develop further into a painting….hopefully. It doesn’t always go to plan!! With the weather over the last few months at an all time grey and not very inspiring for photo outings, I spent some time flicking through our family albums. Enjoying the memories, smiling over forgotten moments, thankful that I have always loved taking photos even if they were just happy snaps, with no thoughts other than capturing the fun of a toddler learning about the world…all on a cheap and cheerful, point n shoot (film!) camera. 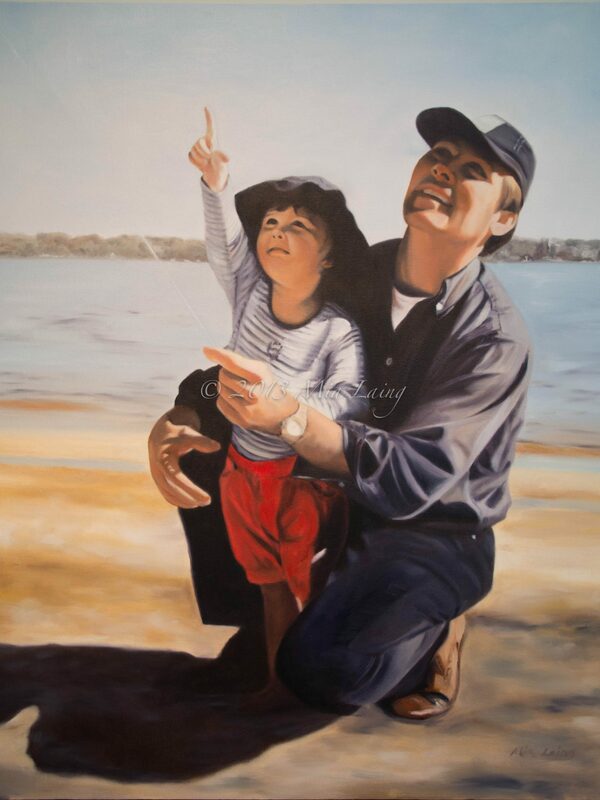 I just knew I had to paint this one of my husband and our eldest daughter, Bel, when she was about three years old. It was the last picnic we enjoyed with my Grandmother, Mutti, before she died, just a few short weeks later. Family time with four generations. 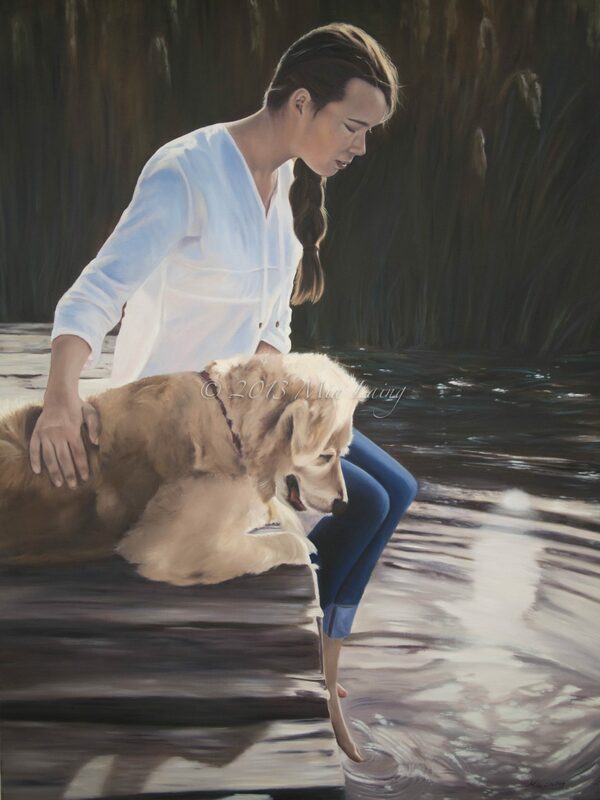 I may be a little biased… but I think this painting speaks with emotion. It tells a story. It has strong composition and it radiates light and warmth. P.E.R.F.E.C.T.I.O.N. This painting is a secret….shhhhh….I’m hoping my hubby hasn’t seen it. So a great way to keep a secret is to plaster it all over the internet…LOL. Dudie’s not on FB; he’s not one of my regular word press followers and I’ve only painted this canvas when he’s been at work. Fingers crossed it will be a surprise still on Christmas Day. And if it isn’t, he can be surprised by a handsome frame around his spoilt surprise! Sure beats the socks and jocks he usually gets. In other news, ‘The Ripple Effect’ has left for judging at the South Perth Emerging Art Prize this week. Thursday is the opening night for the artists…nervous butterflies. The exhibition opens to the public this friday, 25th October and runs through until saturday 2nd November. City of South Perth Community hall, cnr Sandgate St and South Tce, South Perth. Monday to friday 10am – 5pm. Saturday 10am – 3pm. Go take a look if you are in the Perth metro. There’s a public vote – hint, hint! Oh well done Lilian…I would love to see more photos from your travels…study…and London! Have a look at a site called..www.dpreveiw.com. Really great for research. Depends how much you want to spend but there are some great cameras available to all levels and needs. Thanks for your comment! I look forward to your photos at the end of the year. Previous Welcome to Spring – Photo Style!